Certain boaters in Kentucky must carry a valid boater education card while operating on state waters. The BoaterExam Kentucky Boating Safety Course meets the state's education requirements and allows boaters to get certified online. Boating safety legislation is expected to reduce the occurrence of boating-related fatalities. All boaters in Kentucky between the ages of 12 and 17 must have a valid Kentucky Boater Education Card to operate a powered vessel over 10hp on state waters. A Kentucky Boating Safety Course is available from BoaterExam.com, industry leader in boater safety education. The online course includes a 60-question final exam to obtain the certificate. It is believed that this boating safety legislation has helped reduce the number of boating accidents and boating related fatalities. "There’s no question about it; educated boaters are safer boaters" says Kerry Moher, V.P. of Business Development with BoaterExam.com. "Our online course has been an extremely popular option for certification in recent years." The online boating course is recognized by the U.S. Coast Guard and approved by the National Association of State Boating Law Administrators (NASBLA) and the Kentucky Department of Fish & Wildlife. The BoaterExam Kentucky Boating Safety Study Guide is fully narrated, contains interactive flash-based exercises, over 150 animated videos and visuals in every boater safety exam question. "Our students love that they can sit back and learn about safe boating in an interactive environment," says Moher, "the course engages students of all ages and learning styles." The resulting Boater Education Card is NOT an "Kentucky Boating License". Unlike a driver’s license, the Kentucky Boater Education Card is good for life and does not need to be renewed. 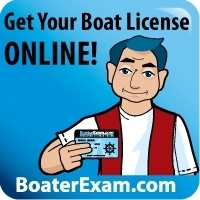 After passing the online safe boating course, a one-time payment of $29.95 is made to BoaterExam for the course and the permanent wallet-sized card. There is a temporary certificate available for print online, and the permanent card arrives by mail in 2-3 weeks.